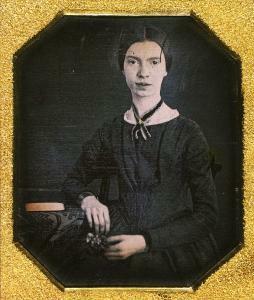 Daguerreotype of Emily Dickinson, from the collection of Amherst College. Emily Dickinson fell early and fast for flowers. Her poetry is full of the blooms and buds that signal the awakening of spring. There’s her crocus, “Spring’s first conviction” (Letter 891) “stir[ring] its lids,” (J10) her May-Flower, “pink small and punctual,” (J 3) and her “chubby” daffodil with its “yellow bonnet” (J 10 and J4), among an army of many other blossoms that decorate her pages. 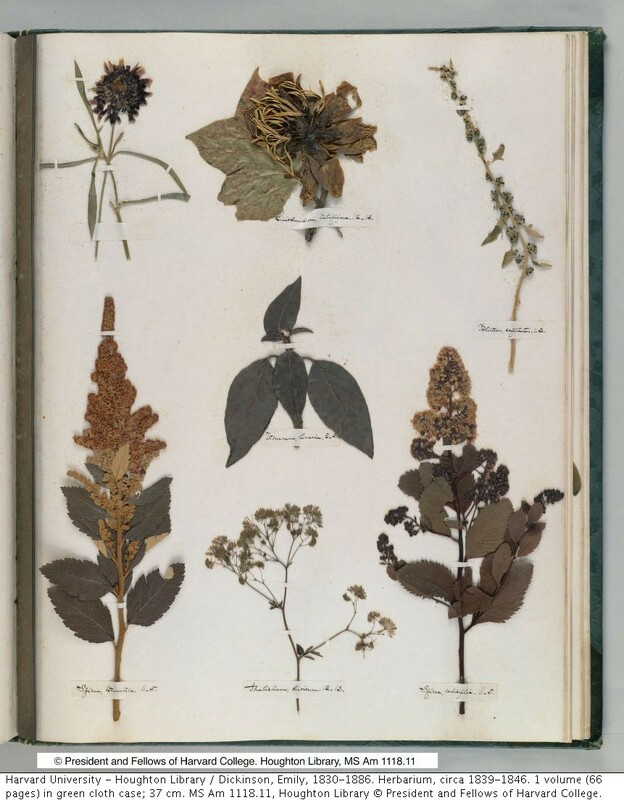 Dickinson likely began her herbarium when she was 14, in 1845.3 It has been fully digitized by Harvard’s Houghton Library (all 66 pages can be viewed here). 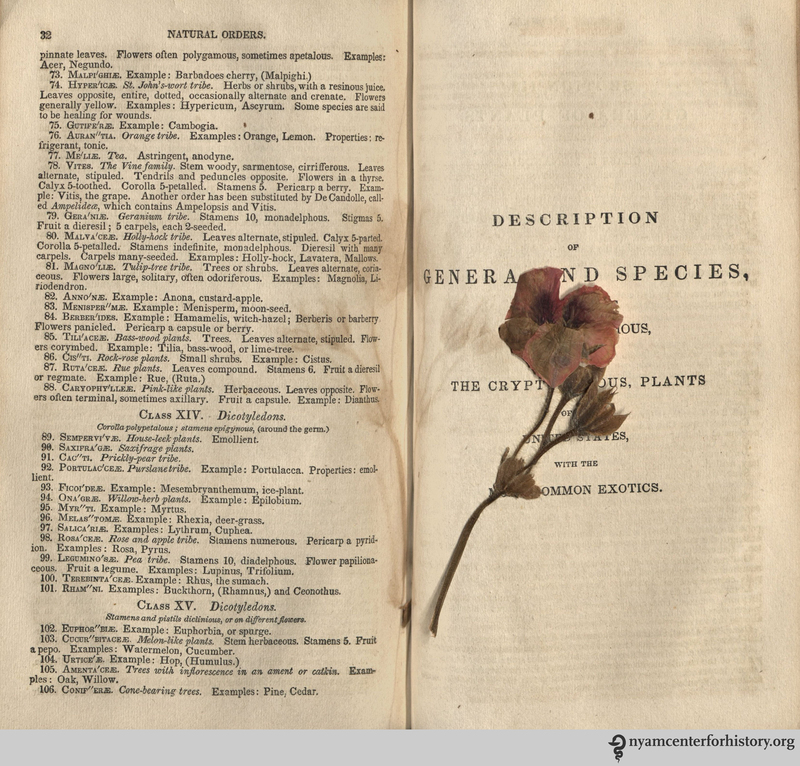 Several of the texts that influenced Dickinson’s flower collection are available in our library. A page of Dickinson’s herbarium, courtesy of Harvard University’s Houghton Library, including specimens of Liriodendron tulipfera and of the rare Chenopodium capitatum (strawberry blite). In 1845, Dickinson was enrolled in both botany and Latin at Amherst Academy. Coursework in both subjects was instrumental in her identification and labeling of plants. 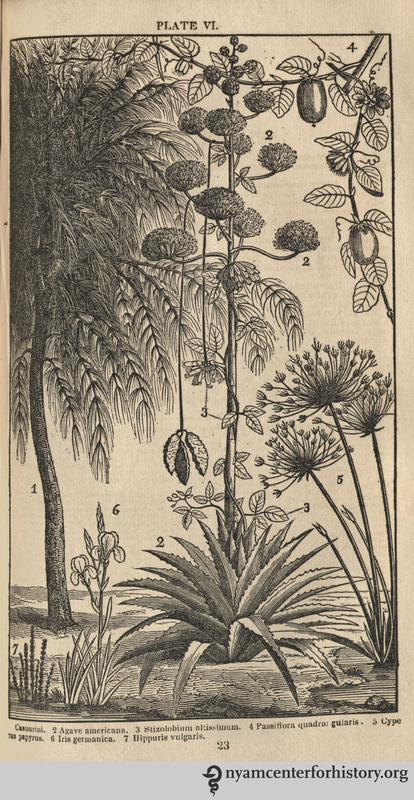 Plate VI from Phelps, Familiar Lectures on Botany, 1838. Click to enlarge. 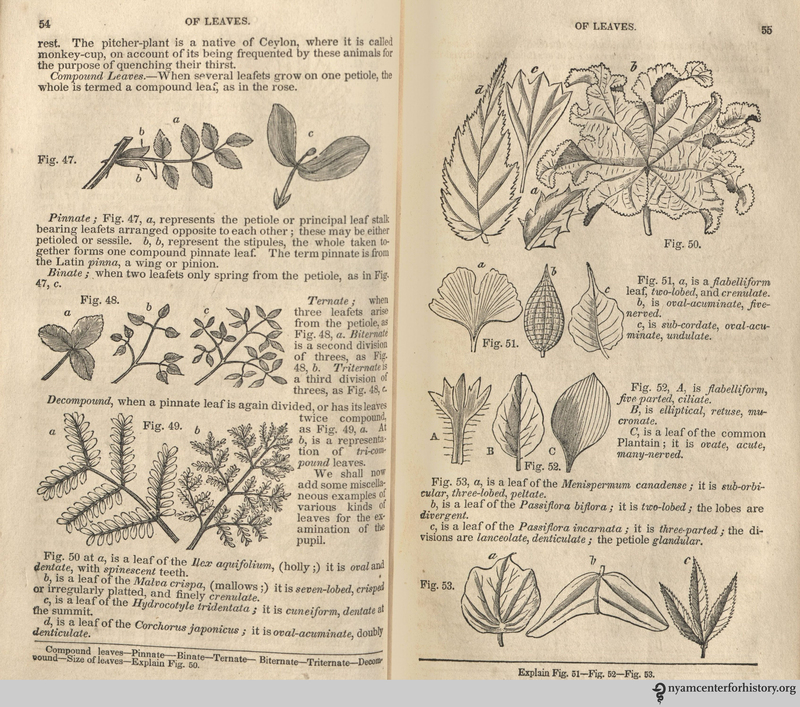 “Of leaves.” In Phelps’ Familiar Lectures on Botany, 1838. Click to enlarge. Emily Dickinson seems to have consulted another book for the organization of her specimens. 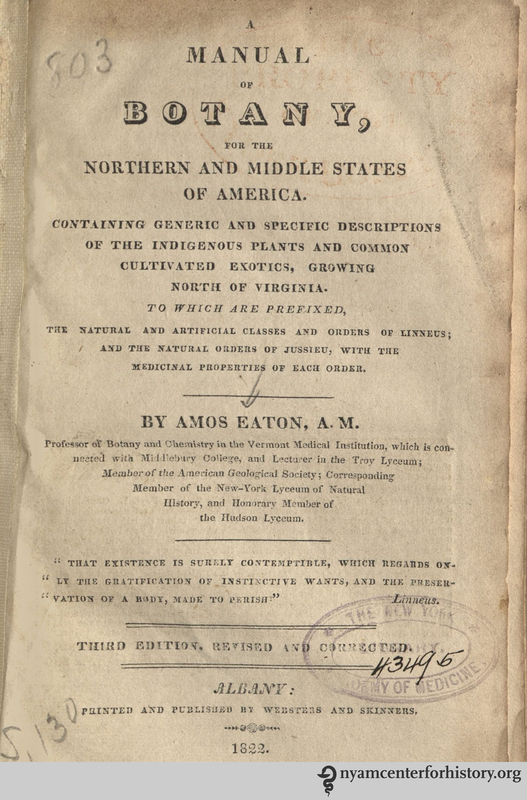 That book was Amos Eaton’s Manual of Botany, for the Northern and Middle States of America. Title page of Eaton, Manual of Botany, 1822. 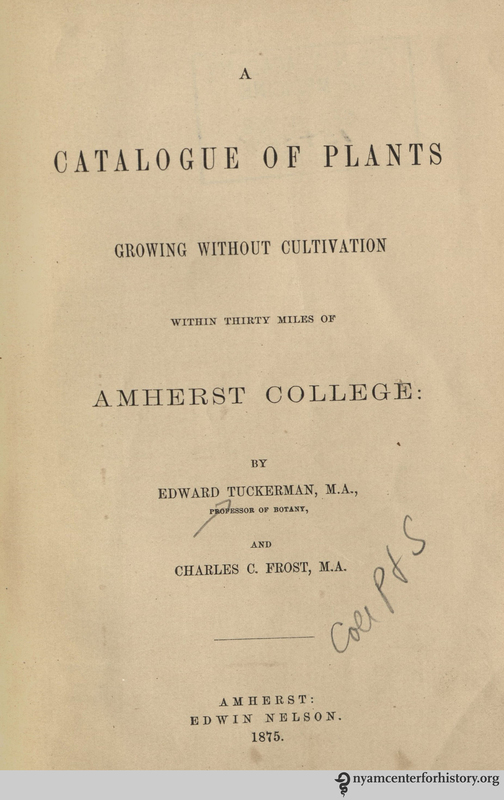 Title page of Tuckerman and Frost’s A Catalogue of Plants, 1875. Dickinson seems to have confused the authorship of the book she mentions above; here, too, she’s likely referring to Eaton’s Manual of Botany for North America. Phelps, Eaton, and Hitchcock’s texts all influenced Dickinson’s impressions of the natural world in girlhood. As a mature poet, as her physical reach and exploration of the natural world became more and more limited, the plants familiar to her from girlhood stuck, fixing their roots all the more deeply in her mind. Perhaps you’d like to buy a flower? 1. 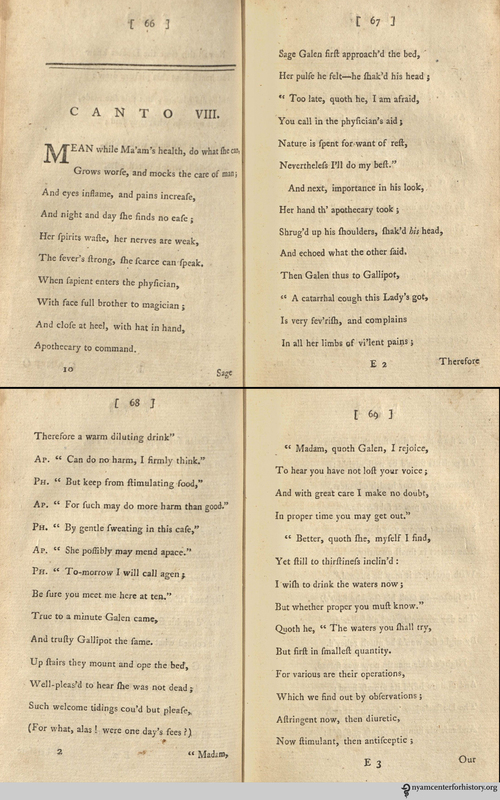 Johnson, Thomas ed., The Complete Poems of Emily Dickinson. Boston: Little, Brown, 1960. 7; Johnson, Thomas and Theodora Van Wagenen Ward, eds., The Letters of Emily Dickinson. Cambridge: Harvard, 1958. 2. Habegger, Alfred. My Wars are Laid Away In Books The Life of Emily Dickinson. New York: Random House, 2001. 5. 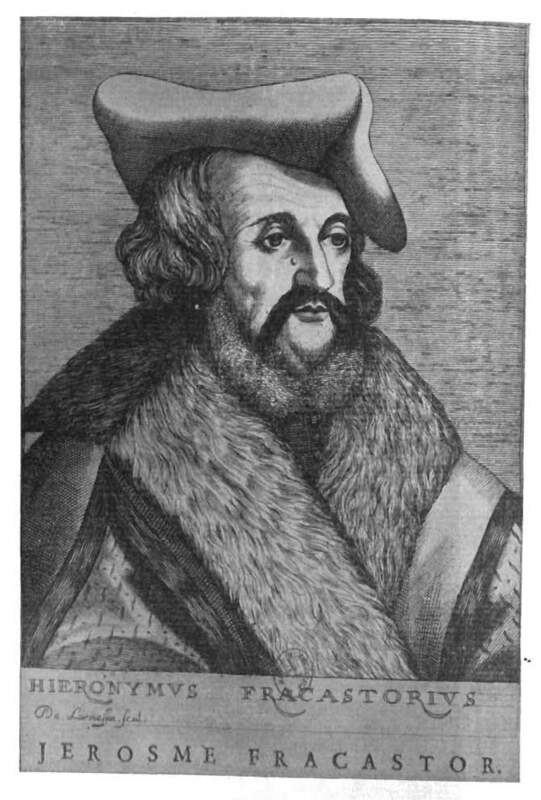 Rudolph, Emanuel. “Almira Hart Lincoln Phelps (1793-1884) and the Spread of Botany in Nineteenth Century America.” American Journal of Botany, Vol. 71, No. 8 (Sep. 1984), pp. 1161-1167. 7. Phelps, Almira Hart Lincoln. Familiar Lectures of Botany. New York: Huntington, 1839. Pp.8-9. 15. Johnson, Thomas and Theodora Van Wagenen Ward, eds., The Letters of Emily Dickinson. Cambridge: Harvard, 1958. 16. 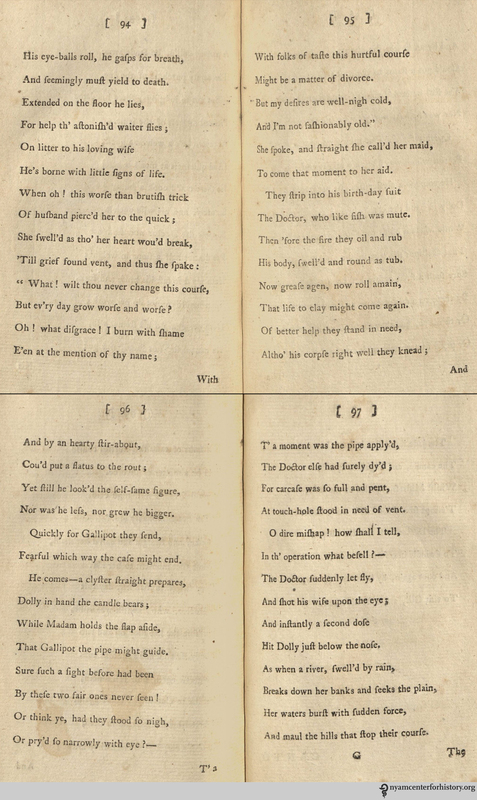 Johnson, Thomas ed., The Complete Poems of Emily Dickinson. Boston: Little, Brown, 1960. 4. Cree, WJ. In memoriam: Hugo Erichsen M.D. Detroit Medical News. 1944;36(12):9. In the introduction of Medical Rhymes, Willis P. King, M.D., writes, “There are a thousand and one things in the life of every doctor which are calculated to cause him to ’break out’ with violent attacks of rhyming.”3 Poetry was one area of life where normally stoic doctors could break free of societal expectations. 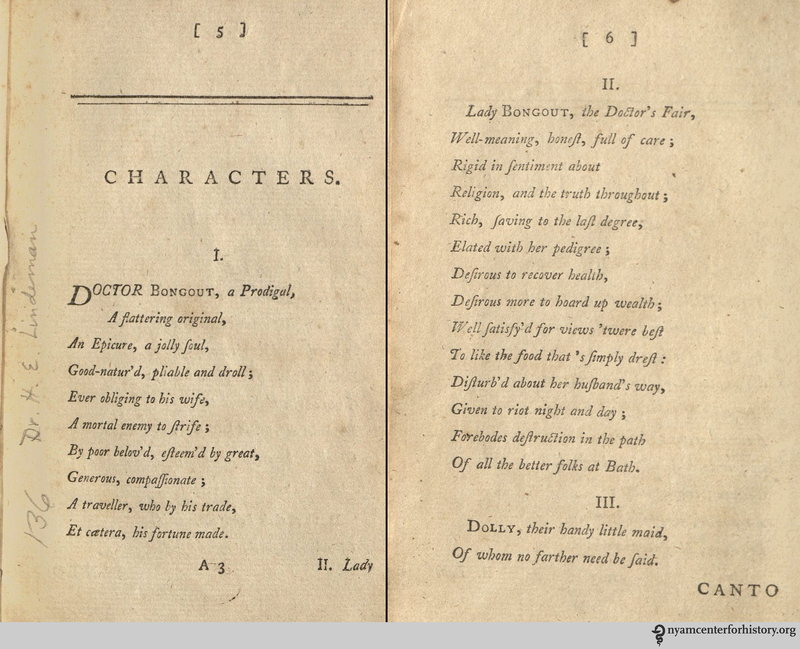 Erichsen divided his book into seven chapters: Anatomical Lore, For Ye Student Men, The Doctor Himself, Medicine, Surgery, Obstetrics, and Miscellaneous Poems. 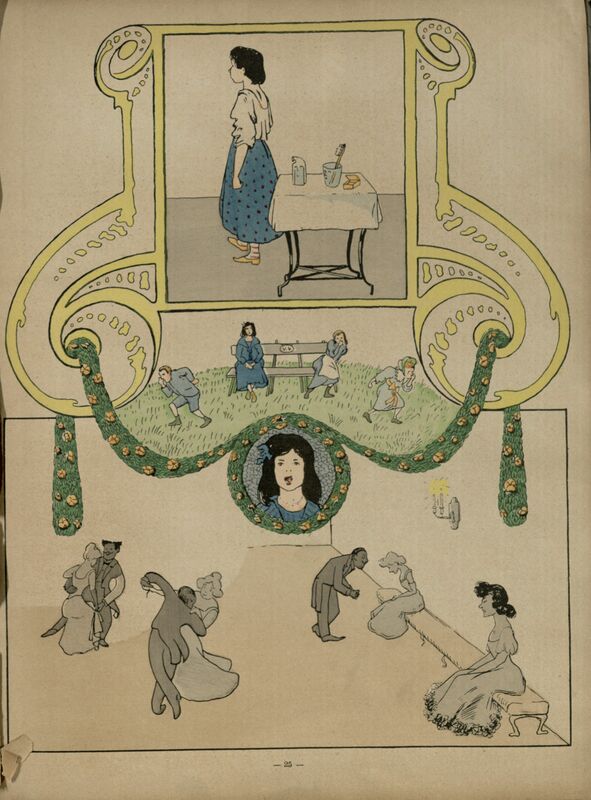 All poems are given attribution, where available, and some include illustrations. 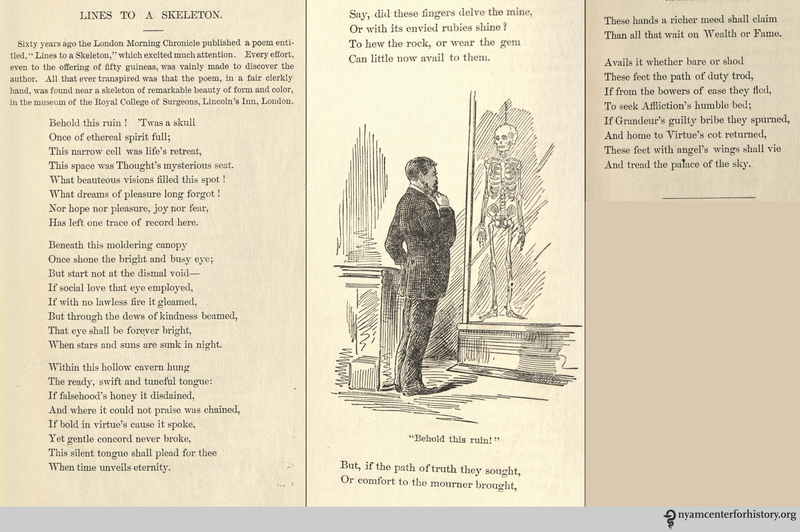 “Lines to a Skeleteon.” In Erichsen, Medical Rhymes, 1884. Click to enlarge. This next poem is attributed to a London medical student and is quite telling of the time, where K is for kreosote and O is for opium. This one even has a little repeating chorus! “The Student’s Alphabet.” In Erichsen, Medical Rhymes, 1884. Click to enlarge. 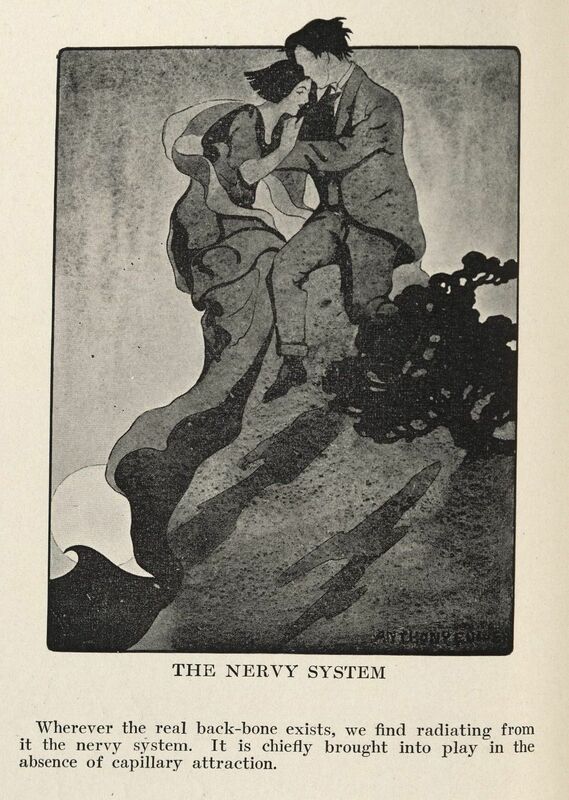 “The Physician.” In Erichsen, Medical Rhymes, 1884. Click to enlarge. 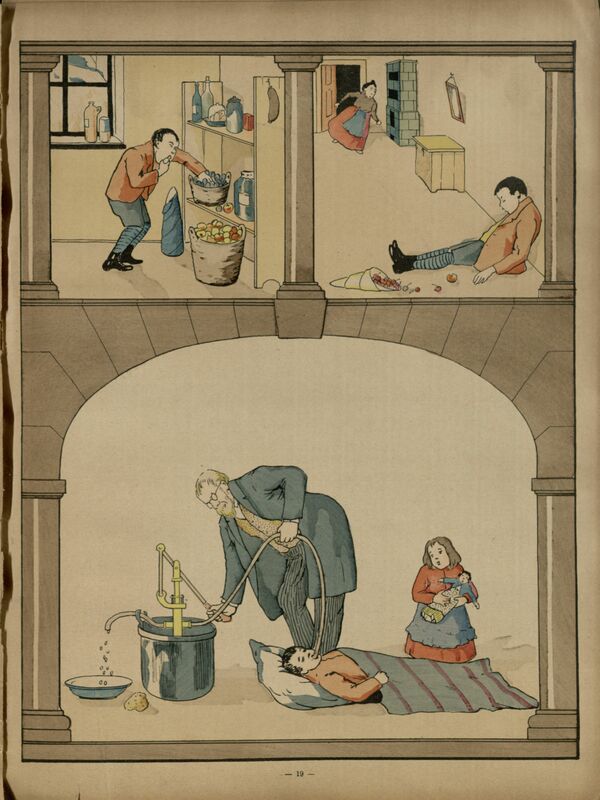 The image below accompanies a 12-page poem by Oliver Wendell Holmes, M.D. The poem, “Rip Van Winkle, M.D.,” recounts the story of young Rip as a doctor who took a “vigorous pull” of “Elixir Pro,” then fell off his horse fast asleep. For 30 years he lay, until the sounds of Civil War battle woke him. But his doctoring was no use, as his methods were 30 years out of date. When he consulted with the modern day doctors, they cried murder and suggested he go back to sleep. Today, he can be found by his mildew-y air. Rip van Winkle, M.D. illustration. In Erichsen, Medical Rhymes, 1884. Click to enlarge. 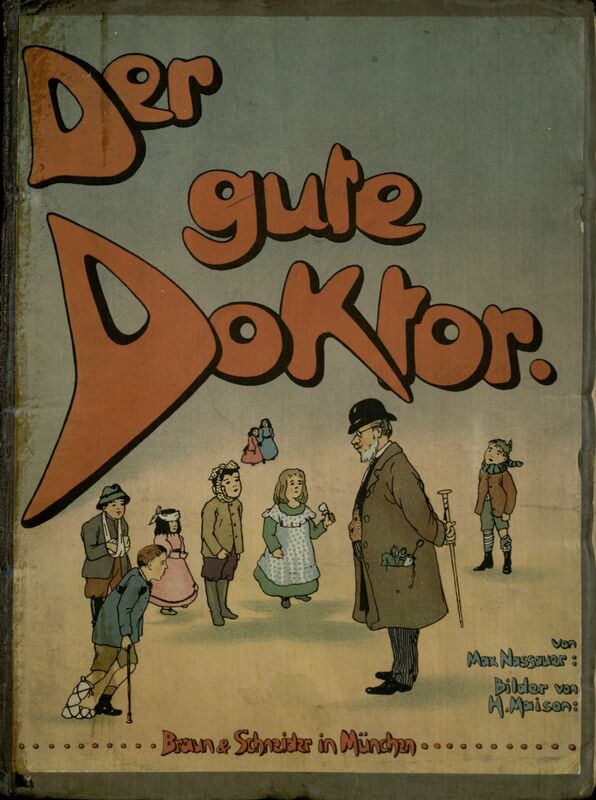 Want more Medical Rhymes? You’re in luck: The book is available in full online. 1. 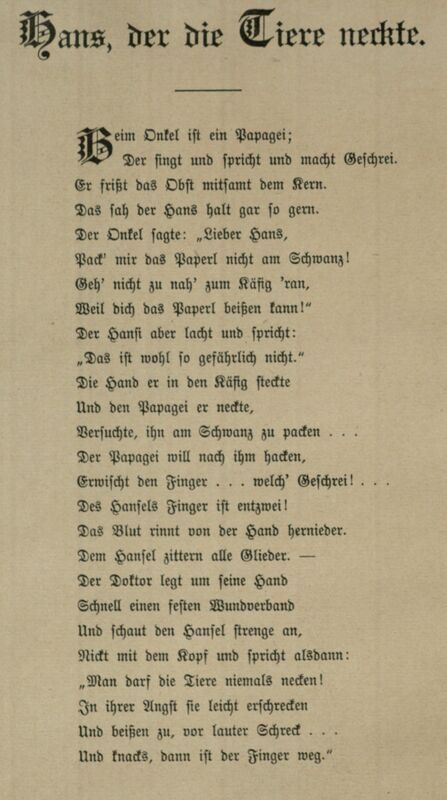 Erichsen, H. Medical Rhymes. St. Louis, MO: J.H. Chambers. 1884. 2. Cree, WJ. In memoriam: Hugo Erichsen M.D. Detroit Medical News. 1944;36(12):9. Two of my favorite books in the library’s collection have, by all accounts, not aged well. Bettina’s refrigerator-buying tips. 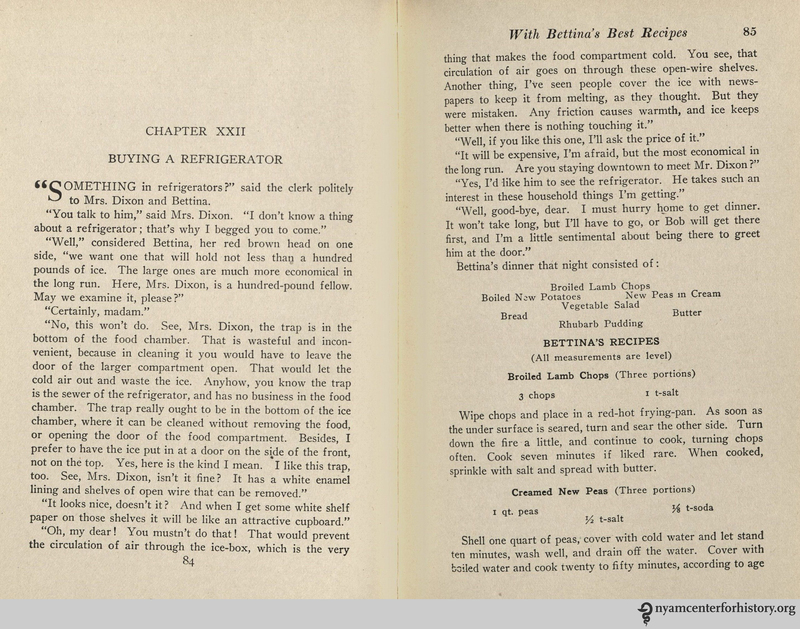 Pages 84-85 of Weaver, A Thousand Ways to Please a Husband, 1917. Click to enlarge. That Bettina sure knows everything. 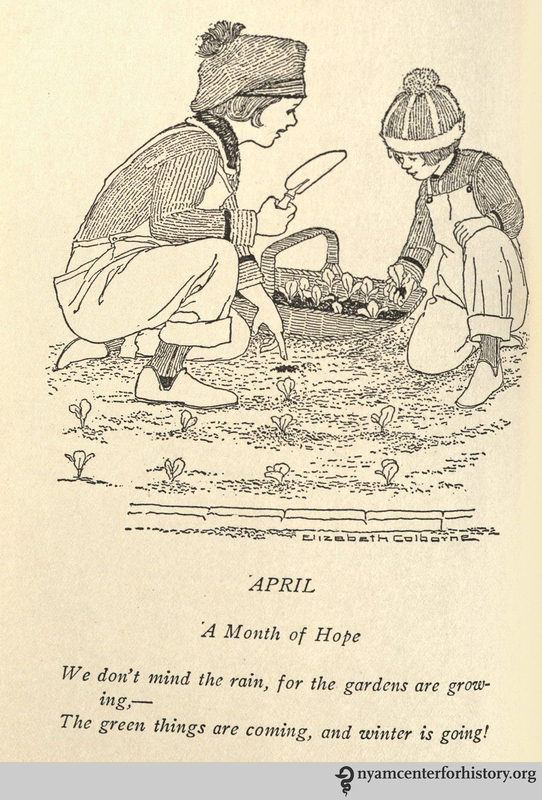 April poem from Weaver, A Thousand Ways to Please a Husband, 1917. 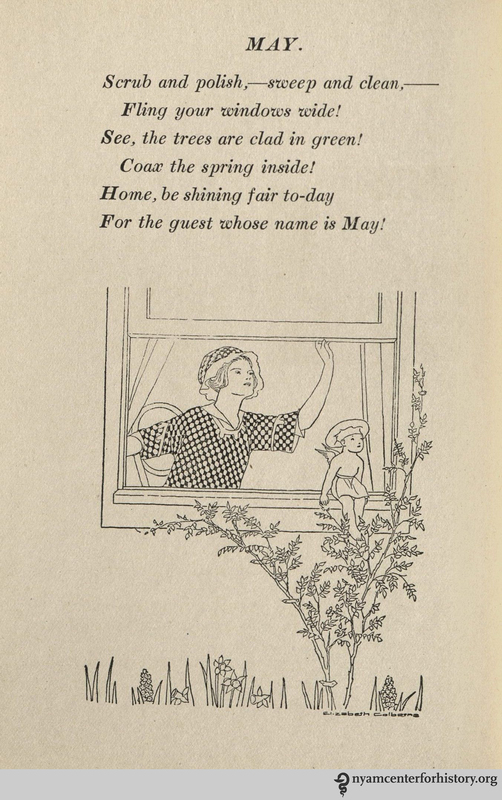 April poem from Weaver, A Thousand Ways to Please a Family, 1922. 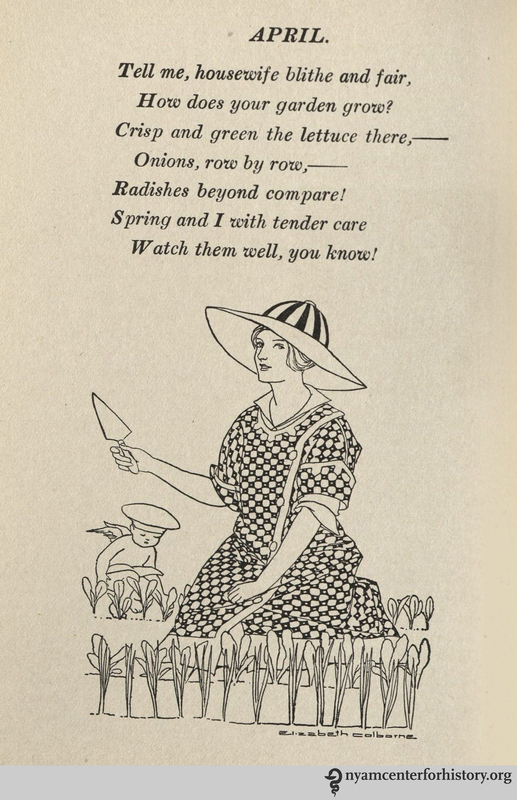 May poem from Weaver, A Thousand Ways to Please a Husband, 1917. 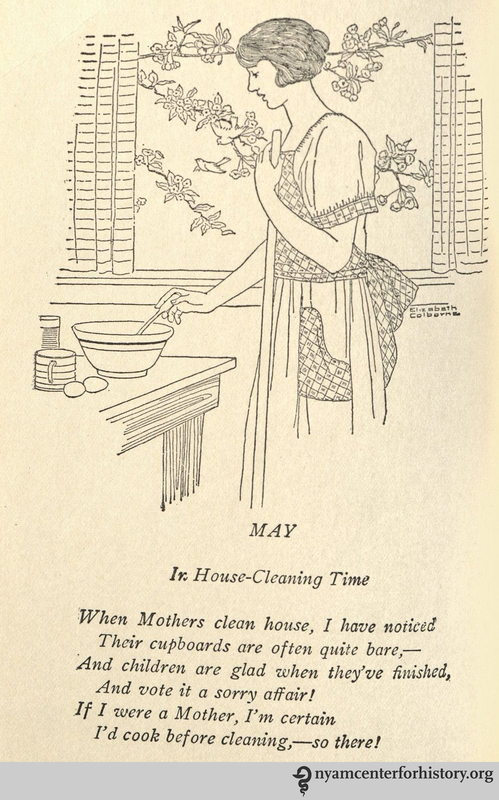 May poem from Weaver, A Thousand Ways to Please a Family, 1922. Though the gender politics are dated, the household advice based on nearly 100-year-old technologies and trends, and the food not always tempting to the modern palate, these books (both available in full online) remain fascinating looks into an idealized home life in the 1910s and early 1920s. Today, Silas Weir Mitchell (1829–1914) is best known as the purveyor of the Rest Cure, made infamous by Charlotte Perkins Gilman’s short story “The Yellow Wallpaper.” But while he was alive, he was renowned as a pioneering doctor of nervous diseases and a successful author. Mitchell began his medical career researching rattlesnake venom. 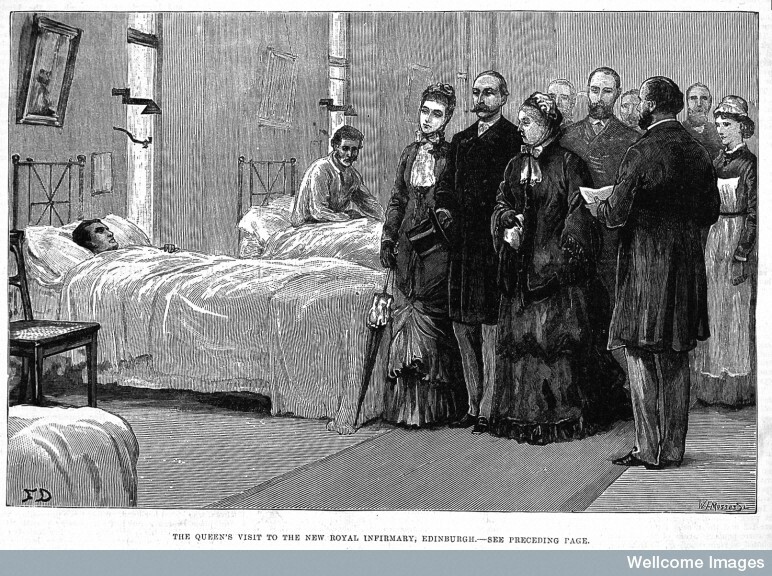 With the outbreak of the Civil War, he shifted focus, beginning work as a contract surgeon at Philadelphia’s Turner’s Lane Hospital, specializing in nervous diseases. 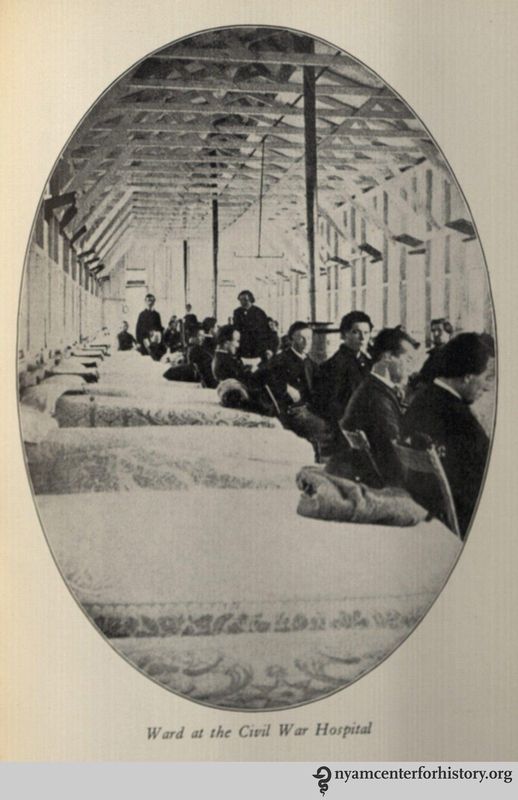 “Ward at the Civil War Hospital.” In Burr, Weir Mitchell: His Life and Letters, 1929. “Dr. 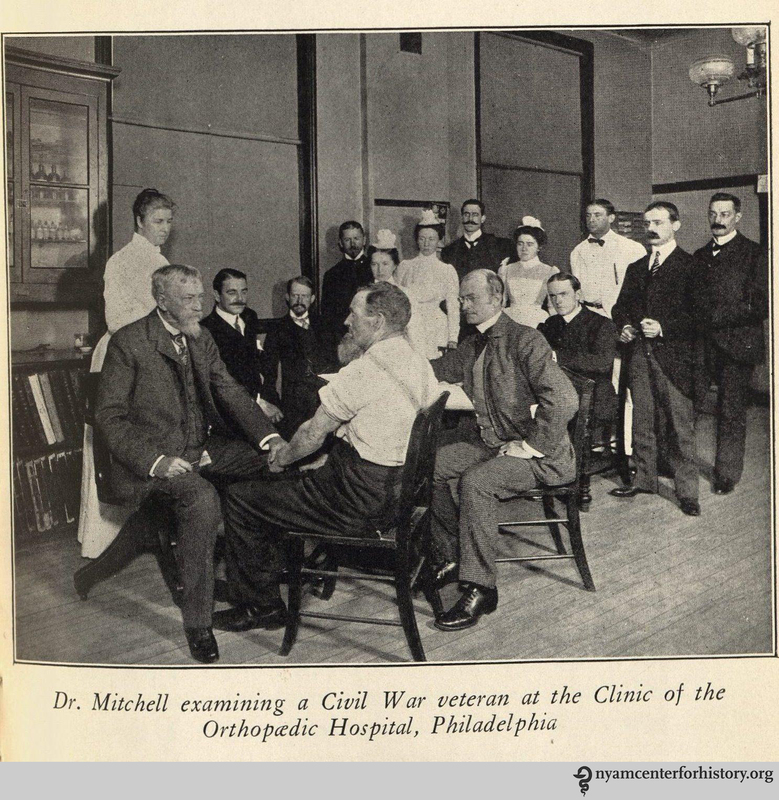 Mitchell examining a Civil War veteran at the Clinic of the Orthopaedic Hospital, Philadelphia.” In Burr, Weir Mitchell: His Life and Letters, 1929. 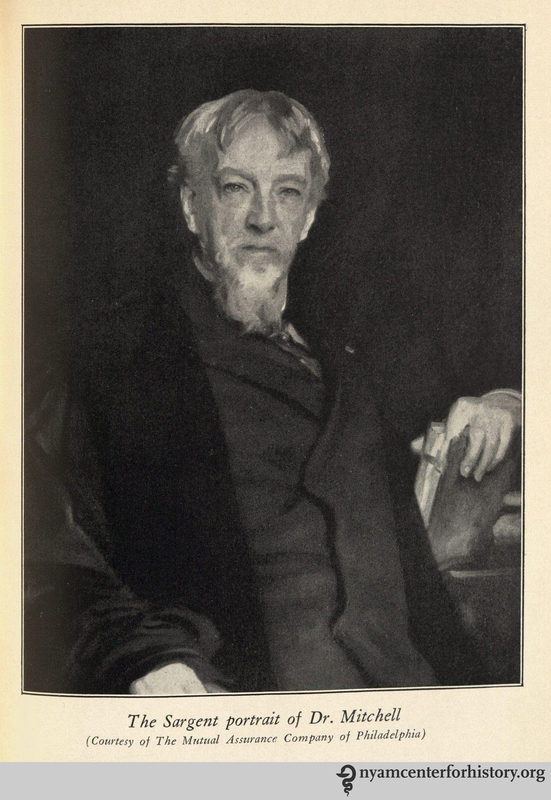 “The Sargent portrait of Dr. Mitchell.” In Burr, Weir Mitchell: His Life and Letters, 1929. 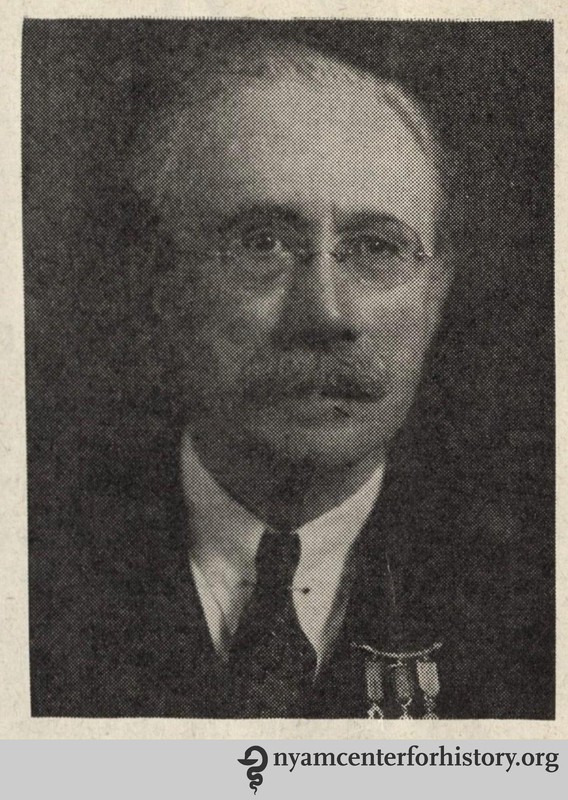 In addition to his medical research and private practice, Mitchell also enjoyed a career as an author. He published numerous short stories, 19 novels, a biography of George Washington, and 7 books of poetry.3 We have one of these poetry books, A Psalm of Deaths and Other Poems (available in full online), in our collection. We feature two poems from the volume here. Unsignaled, unannounced they visit us. The money changers of the temple-soul. To call their kindred comforting anew. In stony ways and brought thy life no gain? And ruled thee with a conscience not thine own? Another world! How shall we find our dead? What forceful law shall bring us face to face? Another world! What yearnings there shall guide? Will love souls twinned of love bring near again? This living and that dead, when life was theirs? Draws into fellowship of loveliness? 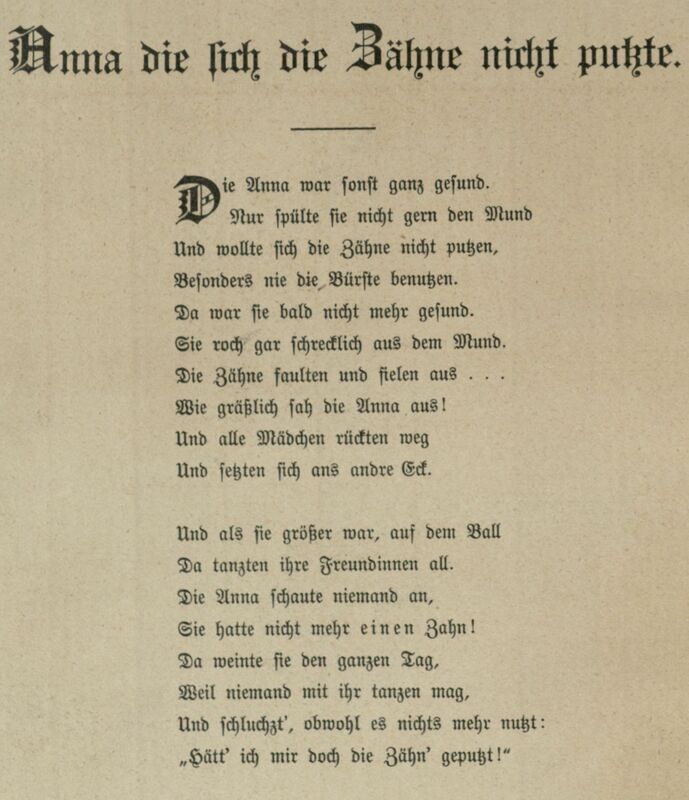 The volume closes with a poem perfect for National Poetry Month: “Of a Poet” (1886). The gracious wisdom of her hills. And trod, with them, the moor and fen. In gentle Words of golden Worth. 1. Silas Weir Mitchell, Papers, 1788; 1850-1928; 1949. 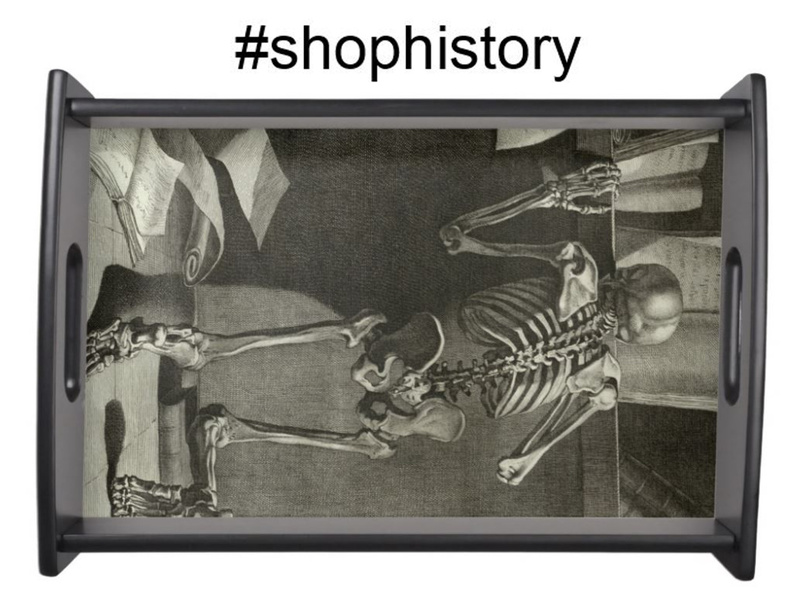 Available at: http://www.collegeofphysicians.org/FIND_AID/hist/histswm1.htm. Accessed April 7, 2016. 2. Bailey P. Silas Weir Mitchell, 1829-1914. National Academy of Sciences; 1958. Available at: http://www.nasonline.org/publications/biographical-memoirs/memoir-pdfs/mitchell-silas.pdf. Accessed April 7, 2016. 3. Todman DH. History of Neuroscience: Silas Weir Mitchell (1829-1914). IBRO Hist Neurosci. 2008. Available at: http://ibro.info/wp-content/uploads/2012/12/Mitchell-Silas-Weir.pdf. Accessed April 7, 2016. 4. Science Museum, London. Rest cure. Brought to Life. Available at: http://www.sciencemuseum.org.uk/broughttolife/techniques/restcure. Accessed April 7, 2016. 5. Stiles A. Go rest, young man. Monit Psychol. 2012;43(1):32. Available at: http://www.apa.org/monitor/2012/01/go-rest.aspx. Accessed April 7, 2016. Anyone who has read a Jane Austen novel or seen an adaptation knows about taking the waters at Bath for medicinal benefit and societal gain. But Dr. Robert Bongout would not be considered decorous company for the genteel gentlemen and ladies in her works. 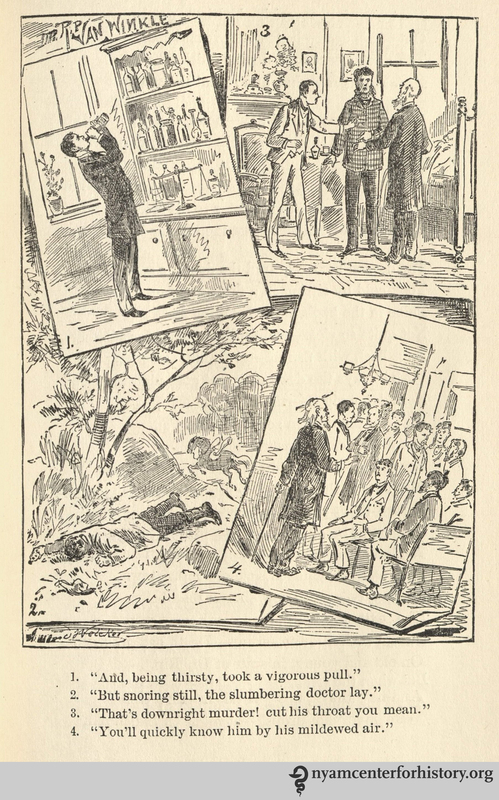 Pages 5 and 6 of The Journey of Dr. Robert Bongout and his Lady, to Bath. Click to enlarge. Over the course of their trip, Dr. Bongout spends copious funds on enormous amounts of food behind his wife, Lady Bongout’s, back. At the same time, she attempts to convince him to save money and eat less, but to no avail. Such things as ducklings to be got? He tucks in after his wife has gone to bed; half asleep, she stumbles upon him eating the stewed ducklings, thinks him a ghost, and faints (so true to life). Pages 66-69 of The Journey of Dr. Robert Bongout and his Lady, to Bath. Click to enlarge. Her maladies lead to blindness, which does nothing to slow her charming husband: “Then while she’s blind, I wou’d know why / I may not live in jollity” (78). Despite her lack of vision, she still suffers the knowledge of his ever-increasing girth: “For tho’ she could not with her eyes / Distinguish his enormous size; / Yet she cou’d feel to what a bulk / His worship had increas’d his hulk” (80). Dr. Bongout himself goes through a medical crisis after eating “for dinner half a stone in weight” (93). Be warned, gentle readers: these verses are not for the faint of heart. Pages 94-97 of The Journey of Dr. Robert Bongout and his Lady, to Bath. Click to enlarge. Quoth he, “And must you then depart? The very thought will break my heart! Bragg’s playful look at gluttony does not end with a moral, only the expectation that Dr. Bongout’s enormous gut will continue its expansion. Nor does it seem that his gluttony will have tragic consequences, only humorous ones. Clearly, he’s called Dr. Good Gout for a reason. 1. Bishop P. The Sentence of Momus: Satirical verse and prints in eighteenth-century Bath. Bath Hist. 1994;5:51–80. Available at: https://www.bathspa.ac.uk/Media/CHC Images/Vol 05 – 03. Bishop – The Sentence of Momus – Satirical Verse and Prints in Eighteenth-Century Bath.pdf. 2. Scholtens M. The glorification of gout in 16th- to 18th-century literature. Can Med Assoc J. 2008;179(8):804–805. doi:10.1503/cmaj.080312. 3. Porter R, Rousseau GS. Gout: The Patrician Malady. New Haven: Yale University Press; 2000. 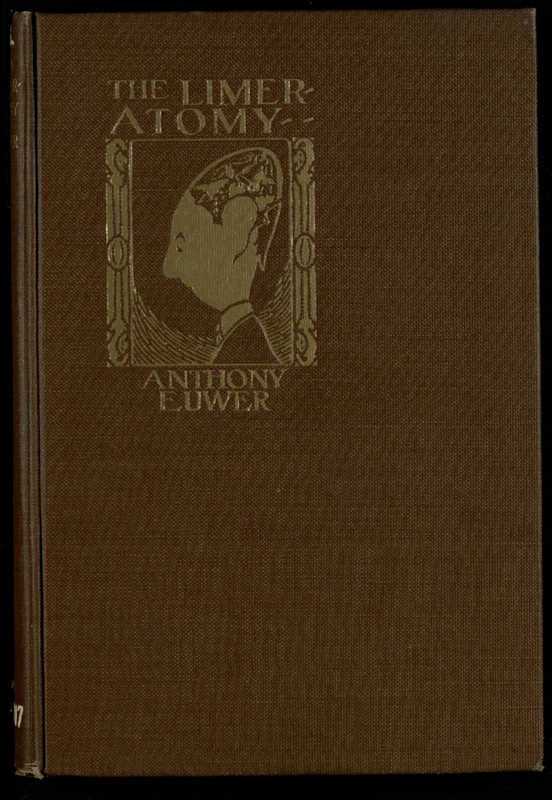 Anthony Euwer, an American poet and painter, published The Limeratomy in 1917. Subtitled A Compendium of universal knowledge for the more perfect understanding of the human machine, The Limeratomy features poems “done in the Limerick Toungue” and is illustrated by Euwer himself. Its contents comprise the more conventional components of human anatomy (the eyes, the nose, the brain, the ears) alongside more intangible or abstract qualities (the soul, the conscience) and some that are more poetic than scientific (the cockles, the funny bone). In this clinic-limerique the author has endeavored to put within the common grasp, certain livid and burning truths that have been dragged from heaped-up piles of scientific expression and kultur. It is hoped that the appearance of this little volume may prove a happy psychology at this time—an age of self-examination—an epoch when the human machine is coming into its own. When the food fails to see where the slot is. 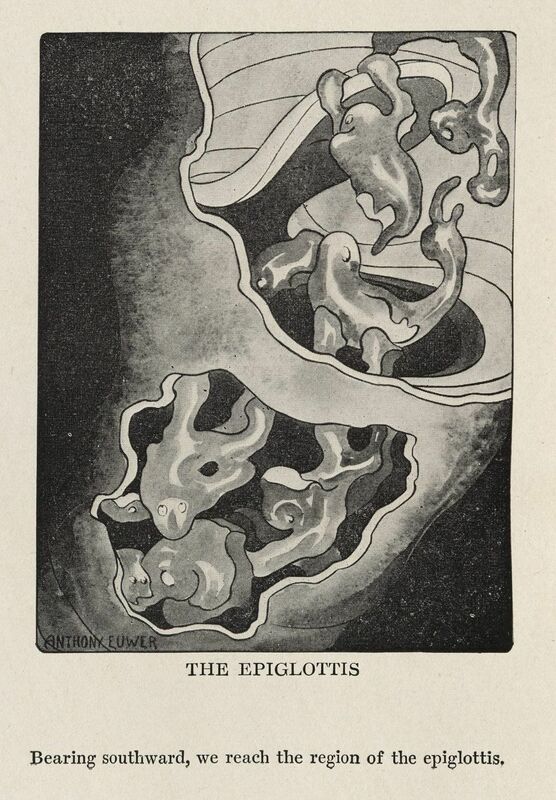 Euwer’s epiglottis illustration. Click to enlarge. 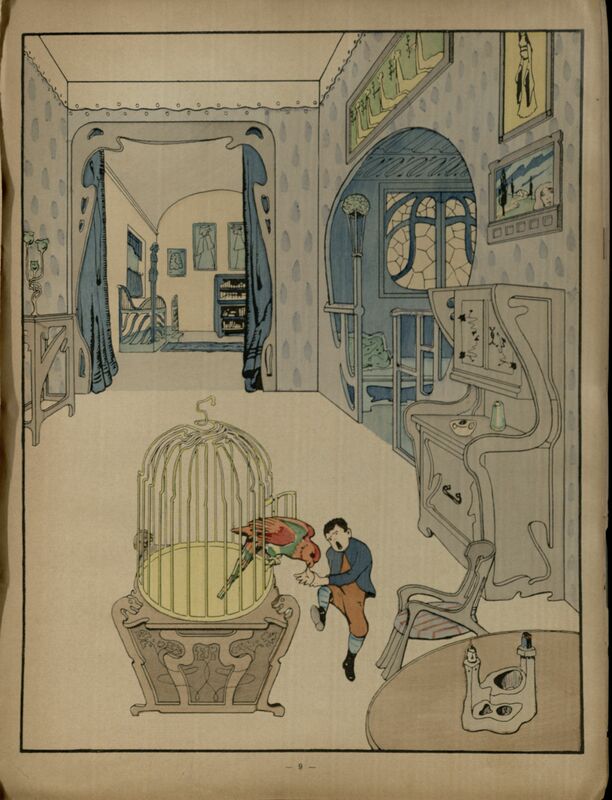 The illustration accompanying “The Medula Oblongata.” Click to enlarge. That the cockles are usu’lly cold. 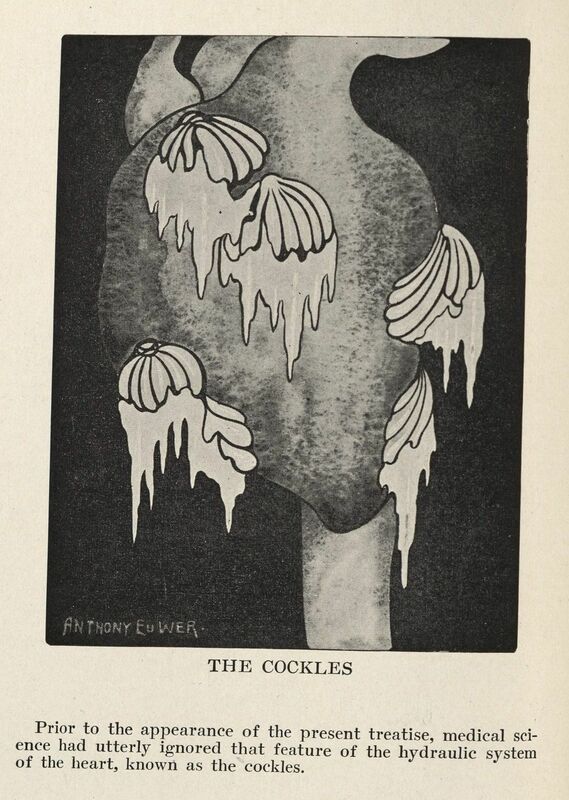 The cockles. Click to enlarge. There are 70 limericks in this volume. You can find them all digitized at the Internet Archive. On our shelves of poetry sits In Hospital, a small, inconspicuous tome by British poet, critic, and editor William Ernest Henley (1849-1903), printed in 1908. Queen Victoria visiting the Royal Infirmary Edinburgh (1881). This Infirmary building opened shortly after Henley’s stay at the hospital. Courtesy of the Wellcome Library, London. To [Henley], life was the supremely important fact; art one of its manifestations. He never separated the work from the man behind it. He did not believe mere skill in the pretty arrangement of words sufficient excuse for writing . . . A man must have a sense of language (which makes literature an art) but he must also have something worth saying, and, having said it adequately, need not trouble about trimmings. And sicken at, it is so foully sweet. Faces look strange from space—and disappear. To an immense, complacent dreamery. You could see his hurts were spinal. And been dragged along the metals. So they covered him, and left him. As himself a few hours after. I was told it was his sweetheart. They were on the eve of marriage. But her lip was grey and writhen. And his throat—so strangely bandaged! When they came, and found, and saved him. In the night I hear him sobbing. But sometimes he talks a little. He has told me all his troubles. Yet so slavish, makes you shudder! 2. Transactions of the New York Academy of Medicine. (1894). New York: Press of Stettiner, Lambert, and Co.
3. Herringshaw, T. W. (1914). Herringshaw’s American Blue-book of Biography. Chicago: American Publishers’ Association. Our last poem, An Elegy on the Death of a Mad Dog, is by Oliver Goldsmith (1730-1774). Our Rare Book Room contains an Oliver Goldsmith Collection, which includes 112 editions of his novel The Vicar of Wakefield, along with many of his other works. Most of the collection was donated by Mrs. Alberta Clay, the daughter of NYAM’s first director, Linsly R. Williams, M.D., in 1942. 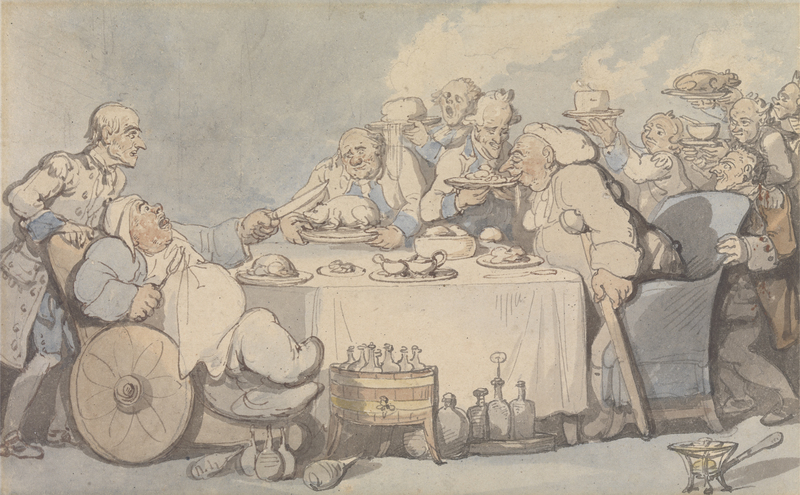 An Elegy on the Death of a Mad Dog is found in The Vicar of Wakefield, where the Vicar asks his son to recite it, and in collections of Goldsmith’s works and poetry. 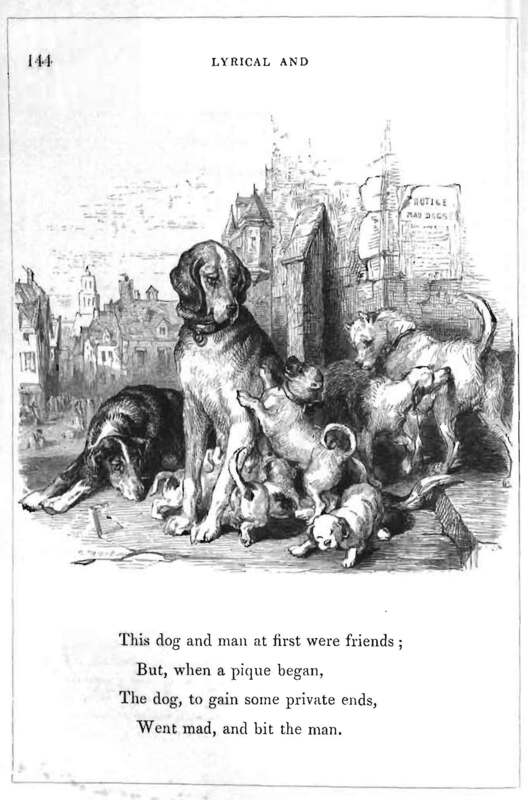 This version and the images are from The Poetical Works of Oliver Goldsmith, M.B. from 1863. Whene’er he went to pray. 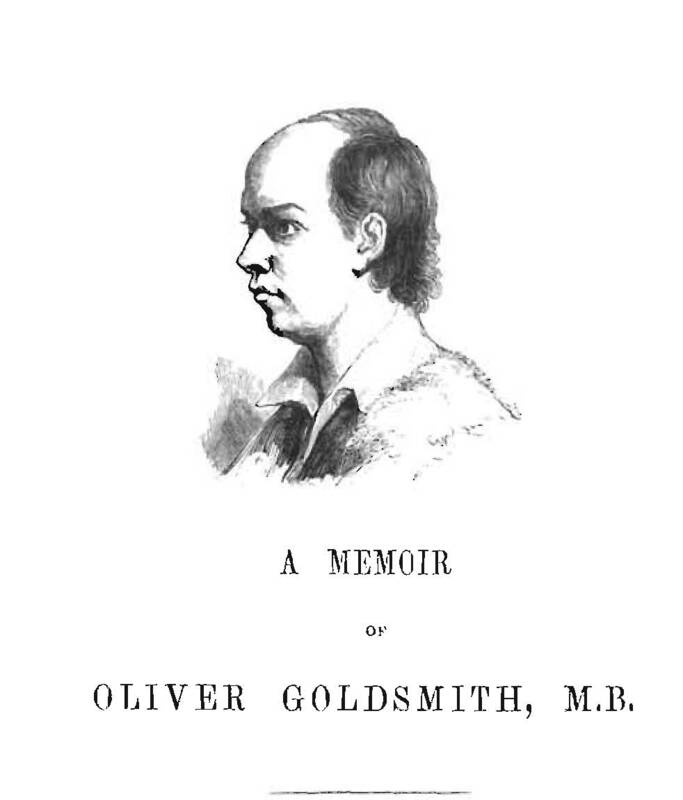 “Oliver Goldsmith.” Concise Dictionary of British Literary Biography. Vol. 2. Detroit: Gale Research, 1992. Biography In Context. Web. 24 Apr. 2013. “Oliver Goldsmith.” Encyclopædia Britannica. Encyclopædia Britannica Online Academic Edition. Encyclopædia Britannica Inc., 2013. Web. 25 Apr. 2013. Syphilis, sive morbus gallicus. Verona, 1530. Syphilis seems like an unlikely topic for a poem, yet it is the subject of an important and popular work. 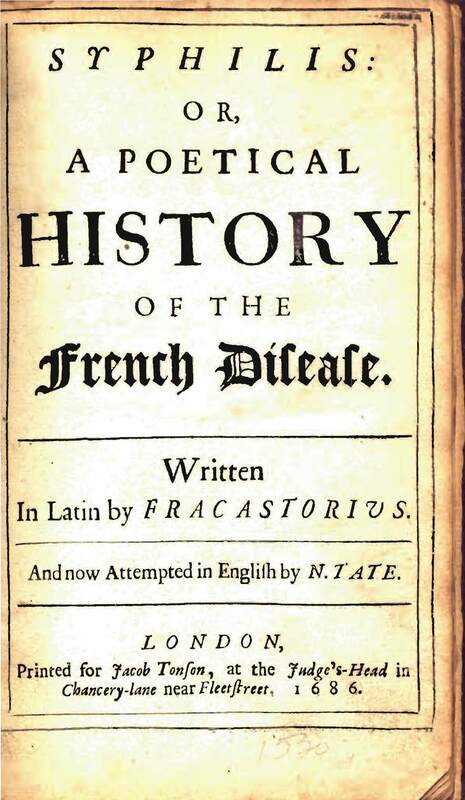 Syphilis, or the French Disease, was first published in 1530. At that time, syphilis was new to Europe and spreading fast. To the Italians it was the “French disease,” to the French the “Italian disease,” with many other countries blaming one another for bringing the infection to their citizens. Written in Latin by the multi-faceted Italian physician and poet Fracastorius, the poem was translated into many languages, reflecting the great desire to understand this disease. Our collection holds multiple editions, including the original, pictured above, and several English versions (this post features two English translations – one is pictured below and another as the excerpts). Syphilis; or, A poetical history of the French disease. London, 1686. In the poem, which is broken into three parts, we learn of the disease and some popular treatments of the time, including mercury and the plant remedy guaiac. We also read the tale of a shepherd named Syphilus, supposedly the first person afflicted with the disease, which was his punishment for spurning the sun. Excerpts from each of the poem’s books, taken from William Van Wyck’s translation, are below. The strangest plague returned to sear the world. From Lybian cities to the Black Sea’s wave. This evil that for long remained unknown! Adding to this world a new universe. Did these men bring to us this latent curse? There burst spontaneously this frightful pest. Since commerce introduced it from the west. Or dyer’s colors of a soothing power. Shall kill this hydra another way. Of agents that will cure a tainted breast. Who had a shepherd lad called Syphilus. A thousand kine this shepherd had to keep. The freshness from the meadow, coolth from breeze. ‘O Sun, how we endure, a slave to you! You are a tyrant to us in this hour. And germinated poisons in our path. To feel his body ache, when sore accursed. Thus was the shepherd flailed and thus debased. That e’en the king escaped not its attack. * From Van Wyck, William. The sinister shepherd: a translation of Girolamo Fracastoro’s Syphilidis; sive, De morbo gallico libri tres. Los Angeles, 1934.